An activist kicks a portrait of Chinese President Xi Jinping during a protest against the upcoming meeting between Taiwan's President Ma Ying-jeou and Chinese President Xi Jinping, in front of the Presidential Office in Taipei, Taiwan, Nov. 5, 2015. Taiwan’s President Ma Ying-jeou said his meeting this Saturday with Chinese President Xi Jinping is not meant to influence the island’s democratic elections in January. Instead, it is about trying to promote more normal ties and help the island have more say in the international community. "We made this decision not because of the next election, but for the happiness of the next generation,” Ma said, speaking at a press briefing in Taipei. “Through this Ma-Xi meeting, we hope that the leaders of the countries will move forward and take the first step in making meetings between cross-strait leaders a normal affair," he added. Ma said that in that way, whoever is elected president in Taiwan can continue to push forward the relationship. 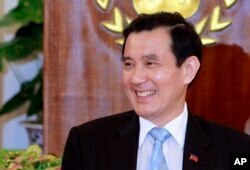 He also said he hoped the meeting would help ease China’s efforts to isolate Taiwan internationally. Taiwan's President Ma Ying-jeou addresses media during a press conference detailing his planned meeting with China's President Xi Jinping, at the Presidential Office in Taipei, Taiwan, Thursday, Nov. 5, 2015. “Taiwan has, for a long time, encountered quite a few difficulties in participating in international events in the past. We have also often heard feedback from the public, in particularly from organizations like NGOs,” Ma said, adding that he hoped that the two could reach a consensus during the meeting to let Taiwan have more say in the international community. Most countries used to recognize Taiwan, or the Republic of China as it is officially known, but now only 22 have diplomatic ties with the island. 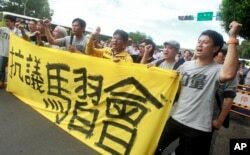 The United States is still a key supporter of the island, but it, too, severed official ties with Taiwan in 1979. Names and titles have always been a tricky question for the two governments, which do not recognize one another. Taiwan and China split amid a civil war in 1949 and Beijing regards the democratically ruled island to be part of its own territory. How much one meeting could do to unravel a host of prickly issues is uncertain. Opposition protesters shout slogans behind a banner opposing the planned meeting of Taiwan's President Ma Ying-jeou with his China counterpart Xi Jinping in Taipei, Taiwan, Nov. 4, 2015. Some have raised concern that by agreeing to not use his official title during the meeting, Ma was downgrading himself and hurting Taiwan. But Ma disagreed, saying that if Xi was to be referred to as president and himself as mister, that would be an issue. During the press conference Ma wore a pin of the Taiwan flag on the lapel of his suit. When asked if he would wear it to the meeting with Xi on Saturday, he said he would not. Ma’s Nationalist Party is trailing in the polls and could lose control of both the presidential office and legislature for the first time when voters take to the polls in mid-January. Some political analysts note that while the meeting may be aimed at lifting support for Ma’s party in the upcoming legislative and presidential elections, it could further mobilize young voters in Taiwan who are increasingly concerned about the island’s ties with its communist neighbor.